Gabe Kapler keeps saying he loves the Phillies' bullpen. The first-year manager proved it by again pulling his starter early. This time, the strategy worked. 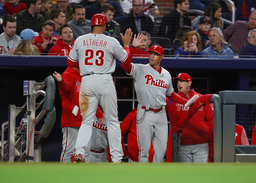 Carlos Santana drove in J.P. Crawford with a sacrifice fly in the 11th inning, and Kapler went through nine pitchers for his first win as the Phillies beat the Atlanta Braves 5-4 on Friday night. Kapler has used a combined 13 relief pitchers in his first two games. He was criticized for pulling Aaron Nola with a 5-0 lead after Nola threw only 68 pitches in the Braves' 8-5 win on Thursday night. On Friday night, he pulled starter Nick Pivetta after only four innings. "I'm well aware that we can't use everybody every night, if that's what you're asking," Kapler said, adding he had a plan for Saturday night's final game of the series. It's clear Kapler wants his relievers to remain heavily involved, and he said "we'll be creative and we'll be flexible" to make the plan work. "We've discussed this and continue to say it's the strength of our club, major strength of our club," he said. "We're going to continue to lean on those guys." Santana, who drove in three runs, said his approach was "don't try too much" after falling behind 0-2 in the count. Philadelphia grabbed a 4-3 lead on Nick Williams' pinch-hit single in the sixth off Jose Ramirez. The Braves took advantage of the Phillies' defensive shift to tie the game in the eighth. Luis Garcia walked Freddie Freeman. With the infield defense shifted against left-handed-hitting Nick Markakis, Freeman was able to advance to an uncovered third as Markakis was thrown out at first on a high bouncer to Garcia. After Chris Stewart grounded out, Preston Tucker hit a tying RBI single to left. The Braves appeared to have the go-ahead run when Dansby Swanson followed with a double and pinch-runner Peter Bourjos was called safe by plate umpire Greg Gibson. But the call was overturned when a video review showed a sliding Bourjos had his right foot in the air as he was tagged by catcher Andrew Knapp. "It was pretty obvious that his foot came up," Braves manager Brian Snitker said. Philadelphia's Rhys Hoskins homered in the third off Mike Foltynewicz. Hoskins' drive landed in the second level of the left-field seats. Santana's homer in the fifth tied the game at 3-all. Foltynewicz allowed three runs, two earned, and five hits in five innings. Phillies: RHP Pat Neshek was placed on the 10-day disabled list with a right shoulder strain. The move was made retroactive to Tuesday. Braves: Braves catcher Kurt Suzuki was hit by a pitch on his right hand in the fourth and remained in the game until the sixth, when he was replaced by Chris Stewart. Snitker said Suzuki's hand is "bruised up pretty good" and he is "probably pretty iffy" for Saturday's game. Suzuki's injury could force a roster move. The other half of Atlanta's projected catching platoon, Tyler Flowers, was placed on the 10-day disabled list before the game after suffering a strained left oblique on Thursday night. Snitker said Flowers' injury was diagnosed as being of mid-level severity. Snitker expects Flowers will need "a couple weeks without doing anything" before taking the next step on his rehab. Charlie Culberson is Atlanta's emergency catcher. Phillies rookie third baseman Scott Kingery had two hits in his first start. Phillies: RHP Vince Velasquez is 0-1 with a 2.77 ERA in four career starts against the Braves entering Saturday night's game. Braves: RHP Brandon McCarthy, acquired as part of an offseason trade that sent OF Matt Kemp to the Dodgers, will make his Atlanta debut. McCarthy is 0-1 with a 2.70 ERA in three career starts against the Phillies.